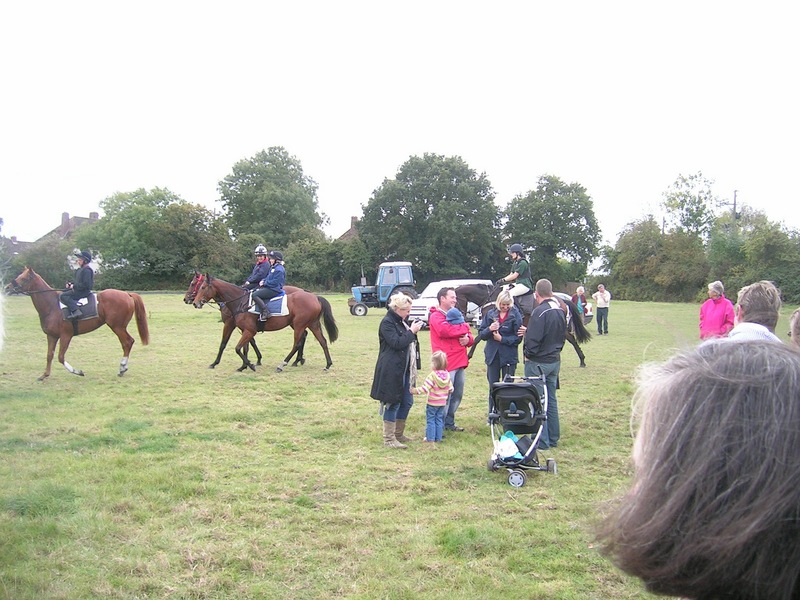 The Owners Open Day was well attended (all age groups) and everyone enjoyed watching some of the horses working on the gallops. Many of the other horses were paraded on the stable block lawn while Linda, owners or breeders gave more information about each one. Excellent refreshments were provided and all agreed that they had had a very pleasant time that whetted the appetite for the season to come. Hopefully the Public Open Day next Saturday will be equally successful. Following the Owners Open Day on 8th October, Linda welcomes the general public to the stables a week later on Saturday October 15th. The yard will be open from 10.30 a.m. until 12.30 p.m. Visitors will be able to see all the horses, watch some horses working on the gallops and ask questions of the friendly staff. Silistra showed that there can be competitive success for racehorses after retirement when finishing third in a class for retired racehorses at The Kent County Show at Detling. He was first judged on conformation and was lying 5th, then the judge rode him to assess his adaptation to riding horse and this moved him up to third place, much to the delight of Karen. He should now go on to Hickstead for a similar competition and then hopefully the Horse Of The Year Show. Although many of the horses are now on holiday, the yard earned more prize money this week. On Monday 30th May DURGAN finished 4th in a handicap at Goodwood over a mile. Under Richard Hughes, he travelled well until switched to make his effort in the last two furlongs where he faltered until switching back to the rail. He ran on but was then unable to catch the leading three. On Thursday 2nd June KING KIEREN finished 3rd in a handicap on the turf at Lingfield over 1 mile 3 furlongs. He broke quickly and led the field until he was headed coming down the famous Lingfield hill. He was unable to quicken to stay with the leaders but he ran on well enough under Eddie Ahern to hold off the rest of the field, going down by a total of six and a half lengths. Rowe Park took his winnings past the £100 000 mark when he finished a close 4th in a class 1 race over 6 furlongs at Lingfield (20/11/2010). This was a great achievement for the stable as Linda and Paul purchased him for just 1200 guineas. Hereditary won an eventful conditional jockey’s handicap hurdle at Plumpton (24/4/2011). Ridden by Peter Hatton, he travelled at the back of the five runner field but well in touch until losing a little ground going out on the final circuit. Then the race changed dramatically as the favourite, who was leading, crashed out at the flight at the start of the back straight almost knocking Hereditary over. This left him nearly 10 lengths adrift but he slowly worked his way back in touch, moving into third around the home turn. He then ran on well up the hill, catching and overtaking the leader after the last to run out the three quarter length winner. She’s Humble notched up her second Plumpton win (28/3/2011) this year by taking a class 5 handicap chase under top weight over 2 miles and a furlong. Ridden by Richard Johnson she jumped well and she tracked early leader, Bid Art, who also likes to front run. She went in front at the seventh fence but Bid Art retook the lead under pressure three out. She was still a length down, but Johnson had not got over serious, when Bid Art fell two out. From there she just had to be kept up to her work to run out the 20 length winner. 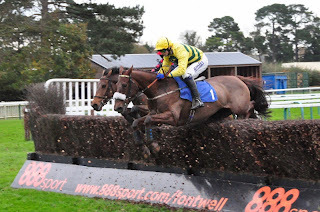 She’s Humble won her second steeplechase today (17/1/2011) at Plumpton, ridden by Andrew Thornton. They went straight into the lead and she jumped really well. The others, bar one, struggled to stay with her going out onto the final circuit and she held the runner up off up the home straight to win by a length and three quarters, with the third another twenty lengths behind. This was a first winner for owners, Valence Racing Too. She’s Humble finished 3rd in a (class 4) 2 mile 1 furlong handicap chase at Plumpton (11/4/2011). Ridden by Andrew Thornton, on very fast ground, she found it hard to stay with leader going out on the final circuit and dropped behind by over 10 lengths after the 3rd last. She stayed on up the home straight, taking third place after the final fence. Roe Valley finished 3rd in a 1 mile 2 furlong maiden at Kempton (23/3/2011). Ridden by Ian Mongan he was held up at the rear this time and it seemed to help. He ran on strongly in the straight and nearly grabbed second, 5 and a half lengths behind the comfortable winner. She’s Humble finished 2nd in a class 4 handicap chase at Plumpton (28/2/2011). On ground that was not really to her liking, Andrew Thornton gave her a sympathetic ride and, realising that she had no chance with the eventual winner, he made sure she enjoyed the race and was able to pass the rest of the field in turn as they faltered. 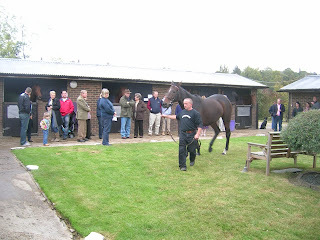 King Kieren followed up his 3rd placed run with a second place, again at Lingfield, over a mile and a half (25/2/2011). Ridden by Eddie Ahern he travelled in midfield until asked for an effort about three furlongs from home. He responded to being driven and ran on well only going down to the well fancied winner by two and a quarter lengths. King Kieren had his first run on the all weather at Lingfield in a 1 mile 5 furlong maiden. (16/2/2011). Ridden by Ian Mongan he was dropped in at the rear of the 5 runner field. He moved up with half a mile to go and challenged for the lead before finding no extra entering the straight. He finished a very satisfactory 3rd, 8 lengths behind the winner but 4 lengths ahead of the 4th placed favourite. Dora Explora earned £238 when finishing 4th in a mares beginners chase at Fontwell (5/11/2010). She’s Humble collected £100 for her owners when finishing 6th in a class 3 handicap chase at Plumpton (15/11/2010). Upgraded web site with new features goes live 30th May 2011. The web site has been developed by Demarque International Limited.